There's such satisfaction when a project is completed. At least, that's how I feel with this one that's been hanging around in its 'waiting to be quilted' state for a while it seems. I did the scraps into squares quite easily, added some sashing (which was the wrong one of two greys I had, but no matter, I hadn't realised until I stood back, looked at it and thought it looked darker. Sure enough I found the lighter grey short while later). Then the border was found and helped to bring it back to life a little more after the sashing. Then I deliberated for a while about how to quilt it. I had considered an all over swirl or generous stipple, but thought I'd give the 'orange peel', I think also known as 'dogwood' pattern a try. It was quite easy and looks quite effective I think. Then in the sashing I went for a simple swirl that ends up looking a little like a treble clef! This quilt is destined for one of many babies I know who are about to make their entrance into the world, so I hope Mum and bub like it. The photos make the border look a little skewed at this point, but it's drying on the line, so it should smooth out a little better once it's dry. Had to take advantage of the weather while I could! What a gorgeous finish, Lynn! 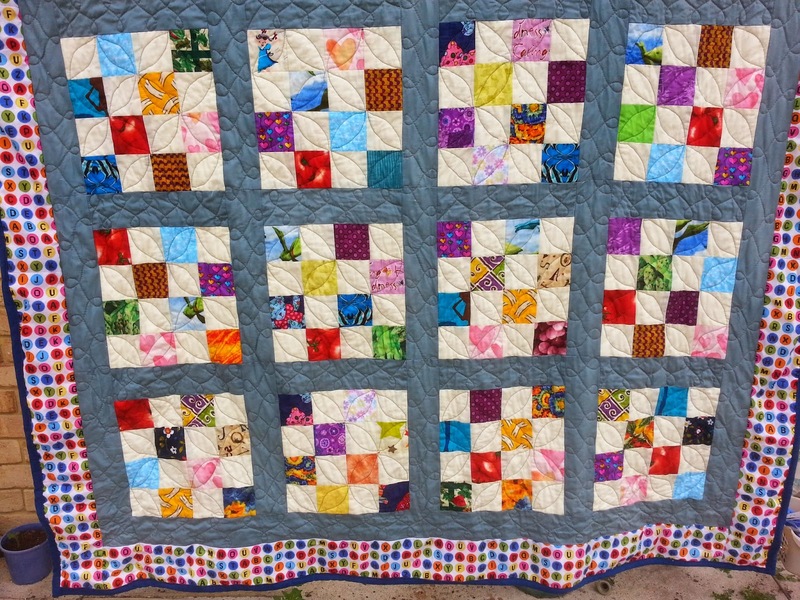 The grey looks great and helps keep all those wonderful colours from overwhelming the quilt. 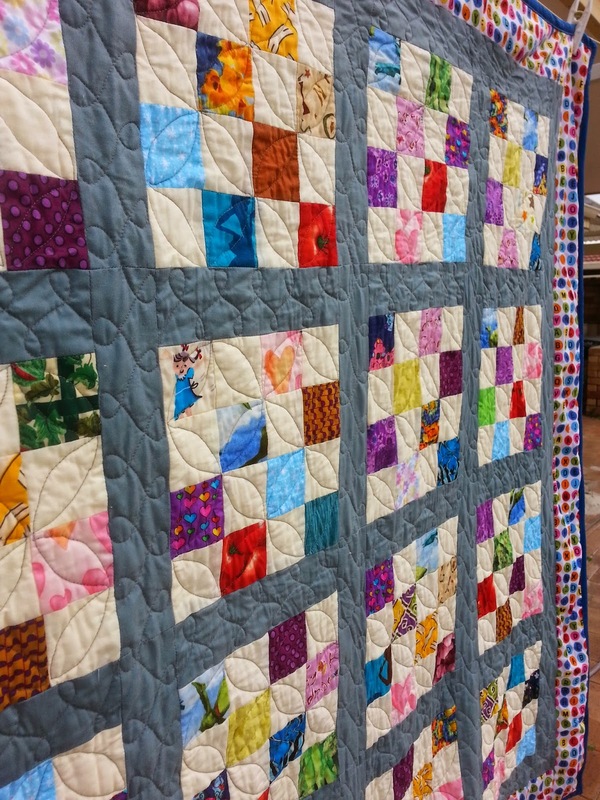 Love the quilting you did! Congratulations! Lynn, I love the circular quilting! Please, did you backtrack to move on to the next circle? On my orange peel quilting I actually did more of a 'leaf' shape beginning in one corner of the 16 patch and then carefully planned on paper, numbering the lines of where I would go before I quilted to know where to go next, so no backtracking. I hope hat makes sense. If I could draw it I would show you.